I’m addicted to Asian food! There, I’ve said it! This mie goreng hits your tastebuds right in their savoury spot so you need this in your culinary repertoire. Mie (or sometimes spelt ‘mee’) goreng is Indonesian fried noodles so if Singapore noodles are your thing then you are sure to love these too. The recipe calls for ketjap manis which is a soy based sauce that is often used in Indonesian recipes. It can be found in a lot of good supermarkets as well as specialist Asian stores ad is perfect for injecting even more flavour into this recipe. I have gone for a combination of vegetables, pork belly and prawns but you can pick and choose to create a dish that suits your tastes. 1. Kick off by mixing the ketjap manis, dark soy, garlic, chilli flakes and sesame oil together. Cut the pork belly slices into bite sized chunks. Boil a kettle of water and boil the chunks of pork for 2 minutes to remove any impurities before removing with a slotted spoon. Next, take a non-stick pan that has a lid and add the vegetable or groundnut oil and sugar. Heat until the sugar has dissolved before popping in the pork chunks. Cook until the pork is golden and then pour in the ketjap manis mix that you made. Pour in approximately 300ml of water and bring the pan to a simmer. Cover with the lid and leave for around an hour and a half until the pork is tender and the sauce is thick and reduced. Check the pork from time to time and if it needs a little more water than add as you go. 2. In the meantime you can prepare the noodles for later by cooking for one minute less than the packet states. Drain well and rinse in cold water. Add a little sesame oil so the noodles don’t clump and set aside. The crispy shallot topping can also be prepared by heating oil in a small pan over a medium to high heat and frying in batches until golden. Blot onto kitchen roll. 3. Take a wok and heat a little groundnut or vegetable oil. Cook the garlic, chilli and shallot until softening before adding the ketjap manis. Stir well to coat. Next up goes the carrot and cabbage for a further minute. Cut the pork belly into bite sized pieces and add to the wok along with the prawns. Cook for a couple of minutes to warm through before adding the noodles. Cook until the prawns are cooked through and the noodles are warmed. Just before serving toss in the nuts and spring onions. Check the seasoning and adjust to taste by adding a little more ketjap manis if you like. Serve in deep bowls and sprinkle over the crispy shallots. Mie goreng- an Indonesian savoury bomb! 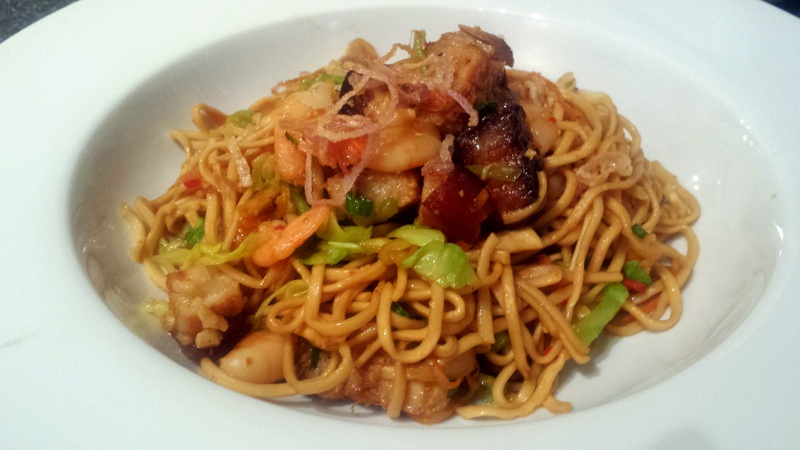 This entry was posted in Recipes and tagged mee goring, mie goring, noodles by sotiris14. Bookmark the permalink.